“She’d clearly been living out there for quite some time, fending for herself out at the dump for months, if not years." Last week, a man was driving past a landfill near Puerto Peñasco, Mexico, when he spotted an old tire close to the road. Something was moving inside, so he stopped to have a closer look. 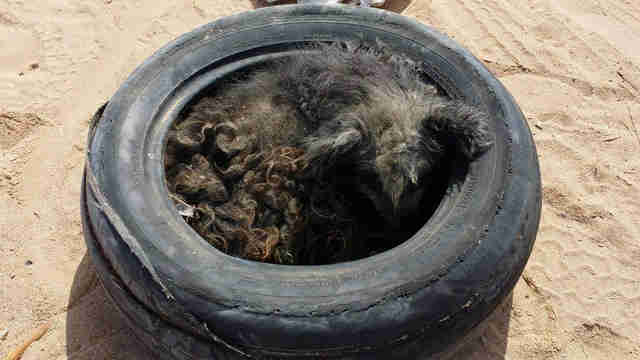 When he approached the tire, he found an old, skinny dog with dirty, matted fur. 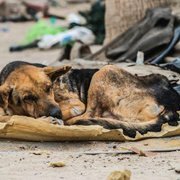 The man contacted Claudia Ortega, manager for a vet hospital run by Compassion Without Borders (CWOB), an organization that rescues street dogs and cats in Mexico, and Ortega quickly went out to the site. 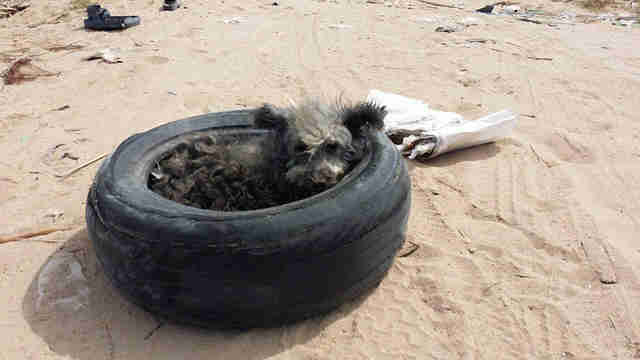 When she arrived, the dog was still curled up inside the tire. “I think that was her shelter,” Christi Camblor, cofounder of CWOB, told The Dodo. “It was the Sonoran Desert, so it’s a pretty empty landscape, so I think that was kind of her spot. When Ortega tried to hoist the dog, whom she named Yoko, out of the tire, the dog snapped her teeth. “She was reluctant and fearful when we first got there, and pretty wary of what our intentions were,” Camblor said. But Ortega didn’t give up — she carefully lifted Yoko up and placed her in a transport crate. Then she drove back to the CWOB clinic. The first thing Ortega did was give Yoko some food and water, which she gulped up. 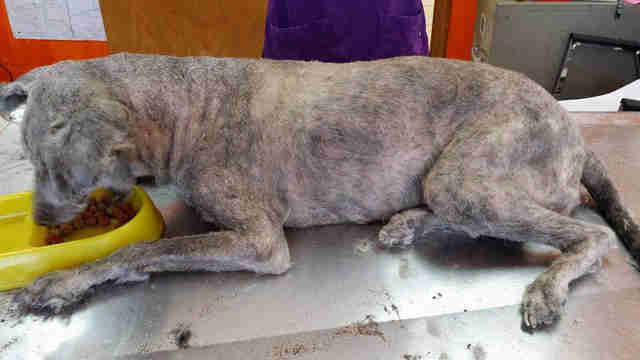 Then the medical team examined the dog, who was estimated to be about 8 years old. 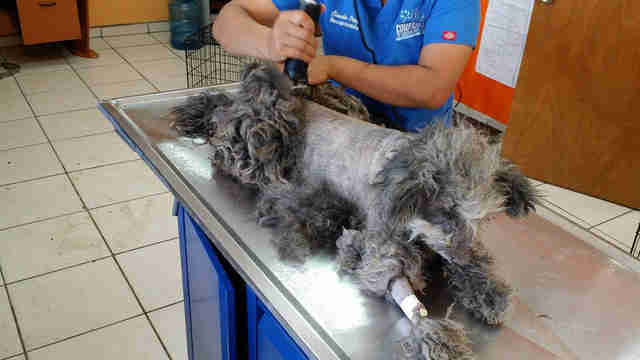 She had so many ticks that she’d gotten ehrlichia, a tick-borne disease that’s common for the thousands of street dogs who live in that part of Mexico, Camblor explained. Perhaps more concerning was the ulcerated wound on Yoko’s stomach, which could be a mammary tumor, and will likely need ongoing treatment, Camblor said. But with care, love and attention, Yoko blossomed. “She got much better, and was very accepting of affection and attention,” Cablor said. After spending a couple days at the clinic, Yoko went home with Ortega for temporary foster care — and Yoko has relished her new environment. “She’s following Claudia around and wagging her tail and acting like a regular companion dog,” Camblor said. While Yoko still has some medical hurdles to overcome, Camblor is confident that she’ll make a full recovery, and plans on moving her to California in a couple of weeks. 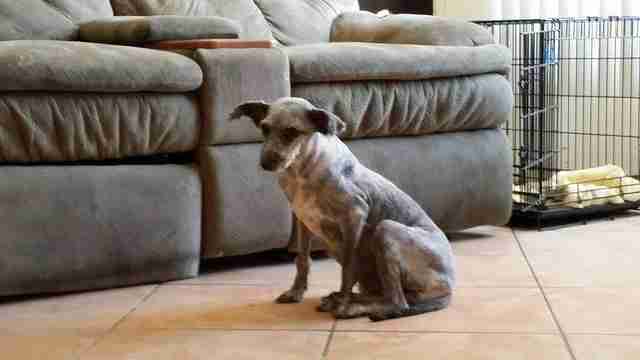 Then, after a month or so, Yoko will be up for adoption. 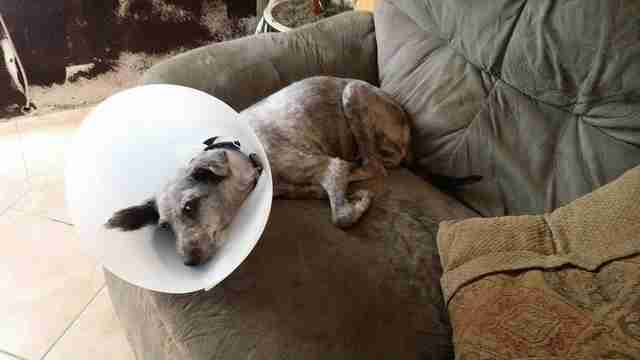 To help Yoko make a full recovery, you can make a donation to Compassion Without Borders. If you’re interested in adopting Yoko, contact the organization.